Ben - Most of the water that we use comes from reservoirs. These artificial lakes are often created by damming a river. Once a large enough body of water has accumulated, you can tap it off, purify it and send it out to peoples' homes; or you can release it back through turbines in the dam to generate hydroelectric power. Simple as this sounds though, there are environmental consequences, including an effect on the local weather. Dr Faisal Hossain is from Tennessee Technological University, and he joins us on the line now. Hello, Faisal. Faisal - Hello, Ben. Good afternoon. Ben - How many dams are there in the world? Do we actually know? Faisal - Getting a precise number is tough but large dams, which are defined by the International Commission of Large Dams as more than 15 metres in height; they're probably about more than 100,000 of these around the world. And approximately, small and large, we might have about a million dams. Ben - Right! 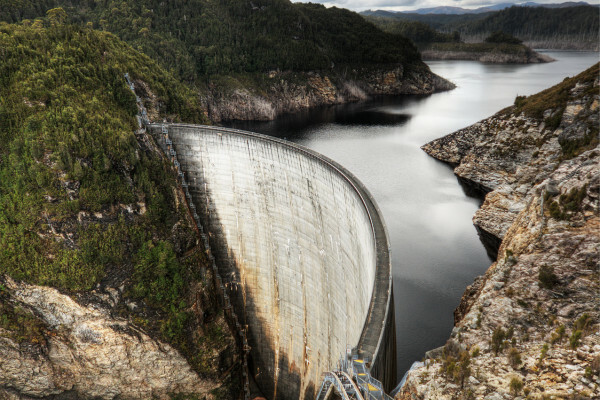 A million dams sounds like an enormous amount. How long have they been around? Faisal - Most of them were built in the early 19th century, all the way up to, I think right after the Second World War. Then in the '60s, I think the environmental issues of it caught up, and most of them were already built, so it stopped right on that time. So, the typical age is probably a few decades. Maybe two to three decades or more. Ben - That seems fairly old for something that we rely on quite so much. Were they built to last? Faisal - Well, dams are generally built to last. You could say, they should last almost forever if they're properly maintained and operated. You should be able to use the dam for what it was built for, for as long as you want. But there are issues with dams, like they get filled up with sedimentation and silt. Sometimes, dredging of the dam and all that gets a little hard and it makes more sense not to use the dam or to decommission or remove the dam from the river. Ben - I'd imagine, removing a dam is quite an engineering task as well. Faisal - Yes, it is. It's still not a very well understood discipline. It's just coming up because now, we have to worry about what we're going to do with some of these dams that we built. We really didn't think about what we were going to do when we built them, if they were not to last forever. Ben - We can see fairly obviously that dams change the river flow in any particular river that they're put into, but what influence do they have on the local weather? Faisal - The first thing is, it's a dam. It impounds the river and it creates an open body of water which is an artificial reservoir or a lake and that itself, being exposed to the sky and the sun, creates a huge source for moisture in the air. That as a quantity may not be much, but if you factor in the other applications for which a dam is being built in particular like say, irrigation; in which you're drawing the water from the dam, the reservoir, and then you're irrigating thousands and thousands of square miles or kilometres, you're actually adding a tremendous amount of water vapour to the air. Thereby, you can actually change a lot of the dynamics of how the rainfall used to form in the pre-dam era. You can drastically change it to have more rainfall and much heavier rainfall than normal. Ben - So it's not just the building of the dam itself, but it's what you're then going to use the water for? Faisal - Yes. If you just look into the dam itself, that won't be much. You have to look into the changes in the landscape and the land use that it triggers, and most dams do because a dam will typically make a region downstream safer from floods. So there's more urbanisation which again has impact on the weather; then you can have more irrigation, or more recreational uses. So you do change the landscape in a fairly drastic way, systematically. It doesn't happen overnight, but it happens on scales over a few decades, and that in turn will lead to some significant changes in the local climate, depending on what kind of climate zone it is in. Ben - This all seems very logical - that when you bung up a load of water and spread it out around the land that you're going to end up with changes in the weather. But do we have any actual evidence that this is happening? Faisal - Actually, we do because there were a lot of studies done by some of my colleagues that we're trying to work with now. At the University of Colorado, Dr. Roger Pielke, who was an expert on climate, he and his colleagues have shown that actually, with irrigation and particularly if you have a very heterogeneous landscape, you can increase the thunderstorm activity. In other words, you can make the thunderstorms more frequent and you can make them much heavier. So there's short bursts of cloud water pouring in. You can make them much more extreme. So those studies have been there, but the connection to the dam and the reservoir as a triggering mechanism has really been looked into from an engineering perspective. Ben - And thinking of the engineering perspective, if building a dam does cause an increase in local rainfall, does this mean that actually, the dams themselves have been designed for less water flow than we now get? Faisal - That is a possibility. Of course, the impact that a reservoir, with its land use change, creates is not uniform or consistent throughout the world. Usually, you might see most of the impact in arid and semi arid regions as we are seeing in our research. If they do change a lot of the rainfall patterns and you end up seeing more rainfall than the "normal" for which it was designed, yes. That, together with the compounding problem of increasing sedimentation or loss of storage can make the situation a little worse. In other words, you'll have more water coming in from upstream, but then every year we're losing a lot of storage in the dam. So it means you actually have them to keep the gates open more than what was designed for. So that is always a possibility. Ben - Does that, in turn, mitigate some of the beneficial effects that you get such as reducing flood risks, if actually, you're keeping the gates open a large proportion of the time anyway? Do you still get the floods downstream that you would've got before the dam was built? Faisal - I think it still does mitigate the big floods. I'm a civil engineer by training, and by the nature of my training, I am very much a pro-dam person. But as engineers, when we built the dams, we always treated all these design parameters for which we build the dam as static . As in, it's going to be the same a hundred years down the road or 500 years down the road. We never considered that the very structure that we're building and the applications that they're serving might itself compromise the design parameters. So, yes - it may not be as successful or as effective as it was before for flood control, but it will still have some value. I think the key thing is to understand for which regions and what type of dams and land use this will be an issue, and to modify our practice of operating the dams that's much more climate friendly and much more sustainable in the 21st century. Ben - With a better knowledge of the impact of building a dam, are we now in a position where we can predict a bit better what would happen if we were to build a dam or if we were to decommission one? What sort of predictions could we actually make? Faisal - Actually, we are - independently, a study of the impact of human activities on the local weather has been going on since a few decades ago. So there's a rich body of research that's been done. People have looked into how urbanisation affects local weather, how irrigation does, how other types of land use change impacts weather - especially the rainfall. So I think we're poised at a very interesting time where we can connect all this to the dam building practices, and we've got excellent computer models that can actually project either 50 or 100-year scenarios into the future of how the local weather might change. And I think this is what the civil engineering profession has to embrace - to be able to do a much better lifecycle analysis, throughout the entire lifespan, predict the major extreme conditions and kind of plan for it in the design itself. Ben - Well I think that sounds like a very promising future for the future of dam design and dam building. That was Dr. Faisal Hossain. He's a researcher at Tennessee Technological University, where he's been looking at how dams alter the local weather.